The December 20, 1921 issue of Adventure magazine carried a complete novel by J. Allan Dunn titled Barehanded Castaways. Unlike most yarns published in “the Dean of the Pulps,” Castaways did not come in over the transom, so to speak, but was solicited by editor Arthur Sullivant Hoffman, who had brainstormed the concept with his staffers. After hashing out the premise and setting some conditions the story’s writer would have to meet, Hoffman challenged Dunn to tackle the assignment. That premise was deceptively simple: Nine average men with widely varying backgrounds are shipwrecked on a deserted island. Lacking tools or weapons—without even a wristwatch among them—the castaways quickly learn that their only chance of survival lays in pooling their skills and knowledge. With the hostile forces of Mother Nature arrayed against them, the nine work constantly just to survive on the most basic level. The strain eventually takes a horrible toll and drives one of their number mad, an event that sends the plot spinning off into another direction. Hoffman’s conditions were that Dunn could not employ the usual plot devices that ameliorated such situations in shipwrecked-on-a-deserted-island tales. The castaways would not reach the island with tools in hand, nor would they be able to salvage supplies from a sunken ship in close proximity. There would be no friendly natives on the island to help them obtain food and fresh water. The nine men, naked or nearly so, would have nothing but their own wits and God-given talents by which to survive. Dunn succeeded beyond Hoffman’s hopes and expectations. Barehanded Castaways became one of the most popular yarns ever to appear in Adventure. Nearly 15 years after its initial publication, when then-editor Howard Bloomfield was preparing the magazine’s 25th-anniversary issue and polling readers to determine which stories they would like to see reprinted, Barehanded Castaways got more votes than any other. The enthusiastic reception to Castaways persuaded Hoffman that a sequel was called for. But had Dunn shot his bolt on the first story? Could he devise a second that would feature the same characters and still maintain suspense? The Island, published complete in the October 30, 1922 issue of Adventure, settled those questions definitively. While not quite the sensation its predecessor had been, the sequel satisfied those who had been clamoring for it. J. Allan Dunn put a memorable spin on the original concept and found new facets in the old characters. It is perhaps better considered as the second half of a long story, rather than a wholly separate entity. Amazingly, neither Castaways nor Island achieved American publication in book form, even though many Adventure novels with far less merit enjoyed that distinction. 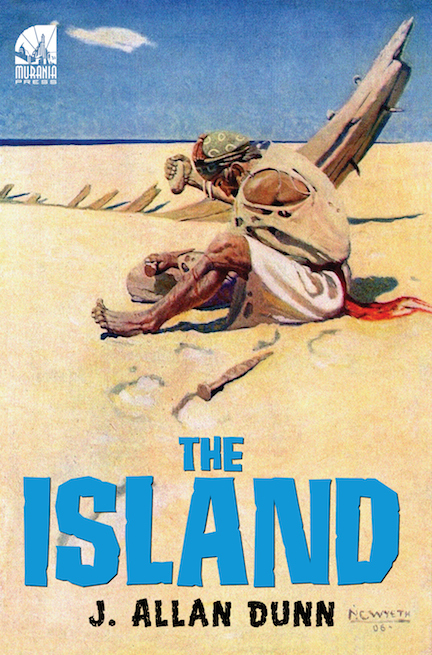 Castaways was published between hard covers in England, however Island was passed up. Barehanded Castaways, which we published as a trade paperback several years ago, has in a small way replicated its initial success in Adventure by becoming the best-selling title in our “Classic Pulp Reprints” line. I expect something similar from Murania’s edition of The Island, which is now available here on the web site. It has the same cover design as Barehanded Castaways to reinforce the fact that it’s a sequel. The Island can be purchased here for $19.95 (postage and handling included for domestic buyers), the standard price for our “Classic Pulp Reprints” volumes. For those who have not read Castaways, however, I’m offering—for the proverbial brief time only—both books at a combined price of $31.95, which represents a savings of 20 percent. You can get the pair here.